Each VBS program is packed with tons of great resources, so what you’re looking for may be hard to find. Our VBS experts have highlighted 6 hints from 6 themes (yes, that’s 36 total) to help you find the instructions and supplies you’ll need most when planning your VBS. Rather than crafts, get creative with hands-on science-like projects at the Imagination Station . Download staff devotions for each day. Browse Cave designs, and create a custom VBS t-shirt with your church name. Cave Quest includes a Missions program, Operation Kid-to-Kid , which provides basic home repairs for those who can’t afford to live comfortably. 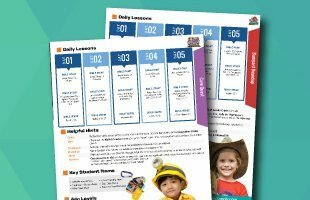 Crafts, science ideas and supply lists can be found in the Craft & Science Leader Cards . Find skits in the Activities & More Leader Cards ; scripts are designed to be used with Cooper the Puppet . Download the Theme Chart and Daily Schedule PDFs. Use Daily Theme Stickers as stamps for each kid’s Diver’s Log or attendance on each kid’s Name Tag Card . Browse underwater-theme designs, and create a custom VBS t-shirt with your church name. Local service project ideas can be found in the Planning Disc Set. Each craft project is available in packs of 12. Find the Udderly Cool Craft Leader Guide in the Starter Kit . Scripts are found in the Barn Raising Storytelling Guide for Elementary Story Time. Polly the Pig Puppet is available with scripts in the Big Barn Early Childhood Leader Guide , and the skits are in the Opening & Closing DVD . Download a sample PDF of the Youth and Adult Bible Study . Nametags are 4″ x 2.5″ cards, sold in sheets of 10. Browse farm and barnyard designs, and create a custom VBS t-shirt with your church name. Tin Roofs for Africa missions project accompanies this theme. Five videos are included in the Opening & Closing DVD . The Marketplace is where you’ll find Egyptian-themed activities for the whole family. The Bible story time- Joseph’s Journey, is staged like a skit. Download all Leader Manuals & Sheet Music in one place. Name Badges and Name Badge Holders are sold separately, each in packs of 10. Browse Egyptian designs, and create a custom VBS t-shirt with your church name. Egypt VBS includes a Missions program, Operation Kid-to-Kid , which provides basic home repairs for those in need of safer homes. Crafts are sold in packs of 6 and listed in the Craft Leader Guide . Science projects are in the Science Leader Guide . The Adventure Video DVD/CD has PDFs of the Assembly Scripts as well as voice-recorded dialogue of Snappy the Crab puppet . Download worship songs your kids will want to listen to again and again. Nametag cards are sold in packs of 24 and nametag holders are each sold in packs of 6. Browse Surf-themed designs, and create a custom VBS t-shirt with your church name. Check out the Snappy the Crab Mission Pillow Kit . The Sunsational Science and Crafts Guide comes with reproducible patterns and easy-to-find materials for crafts and science projects. The Assembly Guide comes with skits for you to perform. You can also use the Drama DVD to see the skits performed by a VBS drama team. Puppet Scripts are in the teacher guides for younger age groups. Listen to sample music to compare traditional and contemporary songs. Order nametags with lanyards or special Name Buttons . Browse ocean-themed designs, and create a custom VBS t-shirt with your church name. Children’s Hunger Fund meets the physical and spiritual needs of children around the world. Look for information in the Starter Kit . Rather than traditional crafts, Expedition Norway invites kids to dig into surprising and authentic things that kids in Norway do, say, and celebrate at the “Experience Norway” station. Check out the KidVid stories on the Celebration Music DVD to learn about God’s love in Norway. Listen to amazing worship music developed for Expedition Norway VBS . Name badges and name holders are each available in packs of 10. Browse Norweigan designs, and create a custom VBS t-shirt with your church name. Expedition Norway includes a Missions program, Operation Kid-to-Kid , which provides basic home repairs for those who can’t afford to live comfortably. Get more VBS tips and planning tools at ConcordiaSupply.com or call our VBS Experts at 1-800-521-0751.